Updated: The Palestinian Health Ministry in the Gaza Strip has reported, Friday, that Israeli soldiers shot 27 Palestinians, including one who suffered a very serious gunshot injury to his head and one in his abdomen, in several parts of the coastal region. Dr. Ashraf al-Qedra, the spokesperson of the Health Ministry in Gaza, said one Palestinian was shot with a live round in his head, east of Jabalia, in northern Gaza, and was rushed to the Shifa Medical center in Gaza city. He added that the Palestinian was rushed to surgery and remains in a very serious condition at the Intensive Care Unit. Dr. Al-Qedra stated that the soldiers also shot six other Palestinians with live fire, after the army attacked protesters near the border fence, in northern Gaza. Furthermore, the soldiers shot four other Palestinians with live fire, including one who suffered a serious injury in his abdomen, and three who were shot in the pelvis and legs, east of al-Boreij, in central Gaza. The army also attacked protesters In Jabalia, in northern Gaza, and shot nine Palestinians. 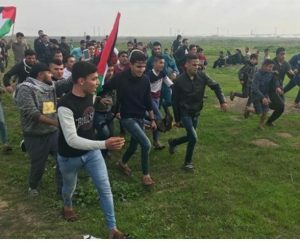 It is worth mentioning that hundreds of residents marched in several parts of the coastal region, especially on Palestinian lands in border areas, east of Khan Younis and Gaza city, and near Beit Hanoun Terminal (Erez Crossing) in northern Gaza. Eyewitnesses said the soldiers, stationed on military towers across the border fence, and many who barricaded themselves behind sand hills, fired dozens of live rounds, including shots fired by army sharpshooters. Furthermore, the soldiers shot five Palestinians with live fire, injured another with shrapnel from a concussion grenade, and caused dozens to suffer the effects of teargas inhalation, in several parts of the northern West Bank governorate of Nablus. The soldiers also attacked dozens of nonviolent protesters in Ni’lin, Budrus and Bil’in villages, in the Ramallah and al-Biereh governorate, in central West Bank, causing many to suffer the severe effects of teargas inhalation. In addition, the army shot four Palestinians, in addition to causing many to suffer the effects of teargas inhalation at the main entrance of al-Biereh city, in the Ramallah and al-Biereh governorate. 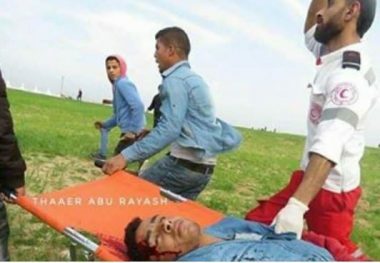 Dr. Ashraf al-Qedra, the spokesperson of the Health Ministry in Gaza, said Israeli soldiers shot thirteen Palestinians with live rounds, including a young man who suffered a very serious head injury, after the army, stationed across the border fence, attacked protesters marching on their lands, in several parts of the coastal region. Dr. al-Qedra said the soldiers shot the young man with a live round in his head, east of Jabalia, in the northern part of the coastal region, causing a life-threatening injury. He added that the young man was rushed to surgery at the Shifa hospital, in Gaza city, and remains in a life-threatening condition. The soldiers also fired live rounds, rubber-coated steel bullets and gas bombs at dozens of protesters, east of Khan Younis, in the southern part of the coastal region, in addition to east of Gaza city, and near Erez (Beit Hanoun) Crossing, in northern Gaza. Eyewitnesses said Israeli sharpshooters were deployed behind sand hills, and at military towers, across the border fence.